The biennial International Conference on Cultural Policy Research took place from the 21st to the 25th of August 2018 in Tallinn, Estonia. The EDUCULT research team participated in a panel discussion dealing with questions on cultural policy in cultural education. In addition, longtime member of the Scientific Committee Michael Wimmer handed over his function to EDUCULT Managing Director Aron Weigl as part of the conference meeting. 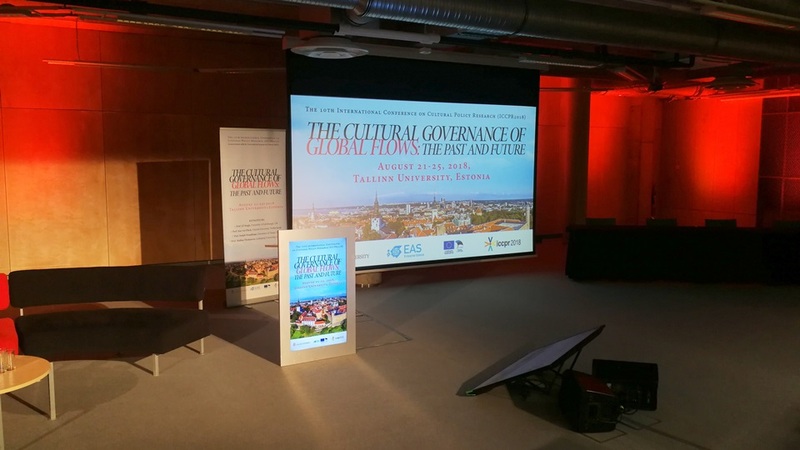 The 10th International Conference on Cultural Policy Research (iccpr2018) in Tallinn (Estonia) was titled “The Cultural Governance of Global Flows: Past and Future”. On this occasion, various challenges shaping cultural policy developments of contemporary societies were discussed. The conference addressed, among others, researches on cultural identity, cultural heritage, migration, labor market, global economic trends relating to (big) data, cultural practices. EDUCULT organized a panel discussion entitled “Re-framing Arts Education. The Challenges for Cultural Policy Making and Framework Setting in Regard to Arts Education”. Michael Wimmer, Aron Weigl and Veronika Ehm presented research results moderated and commented by Sofia Lindström (University of Borås, Gothenburg / Sweden). The panel dealt with contemporary cultural education in German and Austrian policies. It focused on challenges for individual actors, presented and discussed with the audience. Aron Weigl discussed challenges of the performing arts in relation to the German structures of cultural education. Veronika Ehm presented research findings on foundations’ programs promoting cooperation between cultural sector and educational institutions. Michael Wimmer analyzed the cultural policy challenges and dynamics of cultural education in the light of current social developments. During further panel discussions, paper presentations, round tables and keynotes, the EDUCULT team was able to exchange views with the international audience of the conference. Concrete project ideas for research have emerged and new partners have been found. We look forward to seeing you again in Kyoto / Japan 2020! Salon of Cultures – “Co-creations in an inter-cultural and inter-European... Kids Dress Warm!